The cost putting a deceased to his/her final rest place in a coffin is expect to reduce as a result of Government’s decision to zero rate the Value Added Tax system on coffins. Almost ten months after making the promise while delivering the 2012 budget presentation and less than three months before the 2013 budget should be presented, the Ministry of Finance has confirmed that coffins are now zero rated under the Value Added Tax system. A statement from the Ministry of Finance on December 31st 2012 said that after several consultations with the various funeral agents, has come to an agreement on the removal of VAT on coffins. 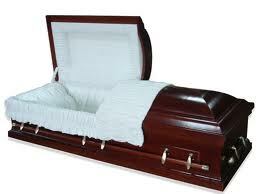 “Effective January 1st 2013, VAT on coffins will be removed. This will be done by zero rating all coffins whether purchased locally or imported. This change only applies to coffins. It does not apply to caskets,” said the statement which advises clients to paid attention to the charges on their invoices from undertakers. While delivering the 2012 budget on March 09th Finance minister Nazim Burke said that Government recognizes that the single largest expense for a funeral is often the coffin. “After consultation with the undertakers, I am pleased to announce that Government has decided to exempt VAT on all coffins. Yes, Mr. Speaker, there will be no VAT on coffins. This means, for example, a person who has to pay $4,800 for a coffin will now save $720,” he said back then.